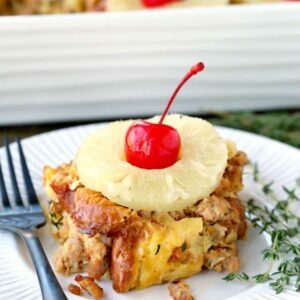 Hot Dog Bun Stuffing Recipe is a fun sausage stuffing recipe for the kids! 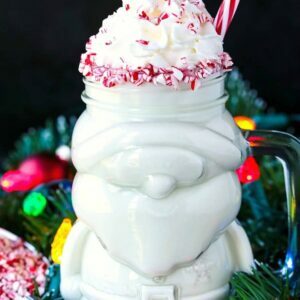 Adults are going to be digging into this too, so make sure you make enough! We’re on day three of Stuffing Week! Today we’re bringing you this Hot Dog Bun Stuffing Recipe and I know you’re going to love this kid friendly stuffing! Hot Dog Bun Stuffing Recipe is our day 4 stuffing recipe for Stuffing Week! 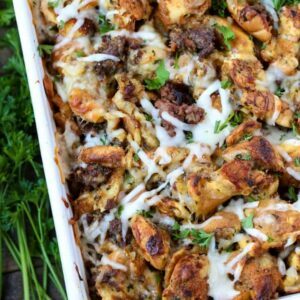 We used our base sausage stuffing recipe, made a few changes and came up with this totally kid approved sausage stuffing! Did you used to have a kid table for holiday dinners? If you’re family was big enough, I’m sure you did at some point. We had them ALL THE TIME. Well by then I had no desire to sit with the annoying kids either. Growing up we didn’t have a lot of different food choices at my house. There were a few things my mom made for dinner and that was about it. She wasn’t an adventurous cook, just made what she knew how to make and made it well. Thanksgiving was always one of my favorite dinners, but it was always the same. The same turkey, the same side dishes and the same stuffing. My mom’s stuffing was actually stuffing – she cooked it inside the turkey, and still does. We usually cook our stuffing, which is technically dressing, outside the bird in a casserole dish. But both ways are so good, I’ll take whatever stuffing recipe I can get. Hot Dog Bun Sausage Stuffing really came into my head because we had 4,000 bags of hot dog buns left over from our Halloween party this year. Usually we’re scrambling for more hot dogs and buns and that was NOT going to happen to me this year. So I bought way more of both than I needed and we had so many left. Since Stuffing Week was on our radar, I thought that using hot dog buns to make stuffing was a pretty great idea. I mean, it’s really just white bread right? Which makes the best stuffing recipes anyway so I figured it was a win win. What Can You Use In Place Of The Sausage? If you added some vegetables like mushrooms and celery you can even make this Hot Dog Bun Stuffing Recipe vegetarian too. Just swap out the chicken broth for vegetable broth and you’ll be all set. How Do You Make Stuffing? The basic idea behind stuffing, or dressing recipes is you have to have some sort of a bread base. In this case, we’re using hot dogs. But the base can be anything from cornbread to sourdough bread, even raisin bread! Next you take the bread base of choice and combine it with some sort of a flavored liquid like chicken broth or beef broth or vegetable broth. Usually you flavor the broth with celery and onions and a few seasonings, then mix it together with the bread. Now get your muscles ready to stir all these hot dog buns, sausage and chicken broth together. Make sure everything is mixed up well then it’s time to add in the cheese. 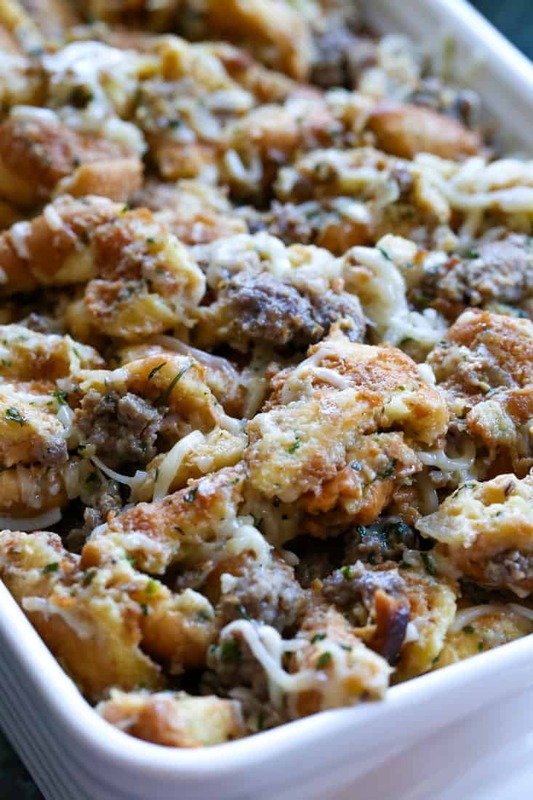 A couple of cups of mozzarella cheese gets mixed into this stuffing recipe for two reasons. One cheese rules. And two, it will help bind the stuffing together in the oven. Now you’re ready to bake! Cover the casserole dish with foil and bake at 350 degrees for 30 minutes. Then remove the foil and let the stuffing cook for another 10 – 15 minutes so that it gets crispy on top. When this Hot Dog Bun Stuffing Recipe is finished cooking, garnish the top with chopped parsley and serve. 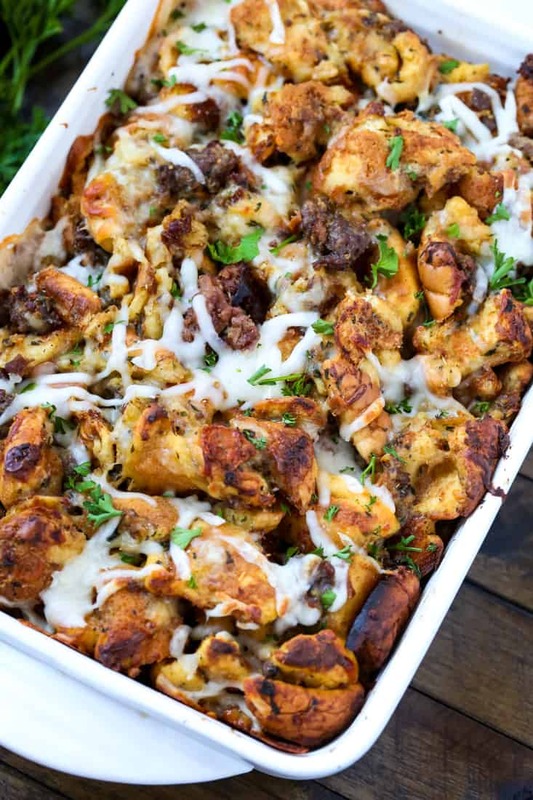 I promise the kids are going to flip for this stuffing recipe. I know mine did. The adults we’re no exception either. Need More Side Dish Recipes? 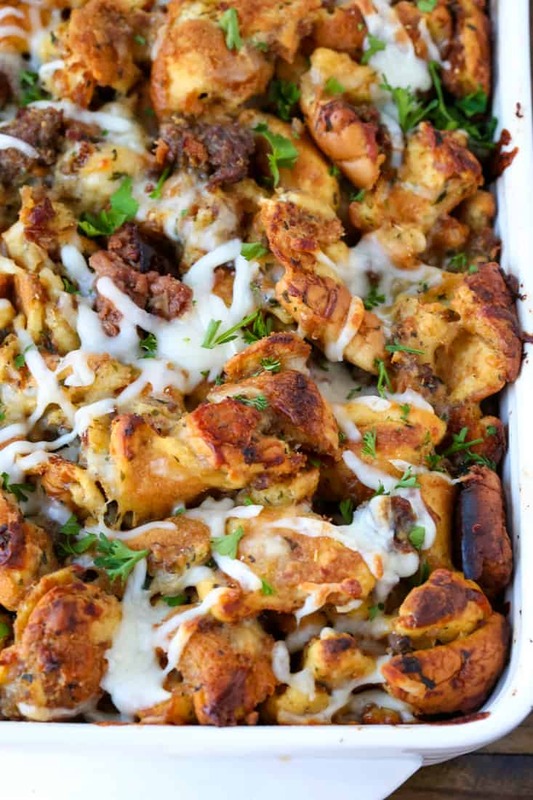 This fun stuffing recipe uses hot dog buns as the base, baked with mild pork sausage and mozzarella cheese! 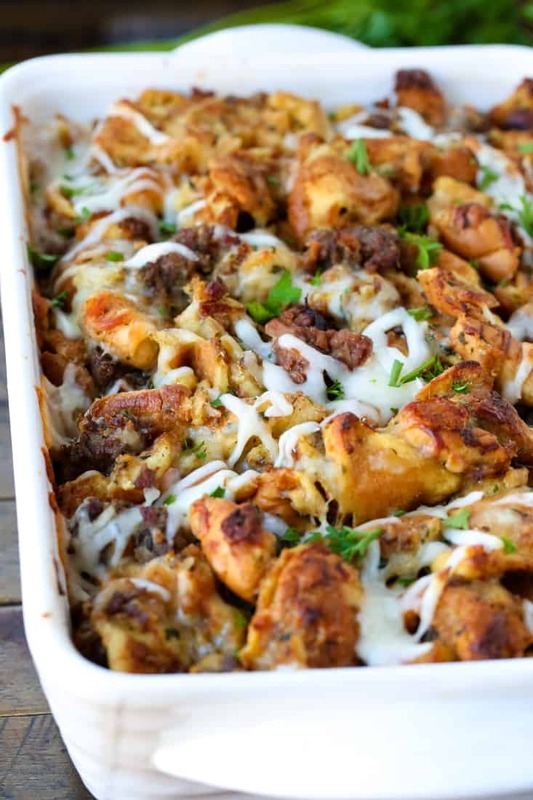 A totally kid friendly stuffing recipe for Thanksgiving! Add the butter to a large skillet over medium heat. Once the butter is melted, add the sausage to brown, breaking up with a spoon. 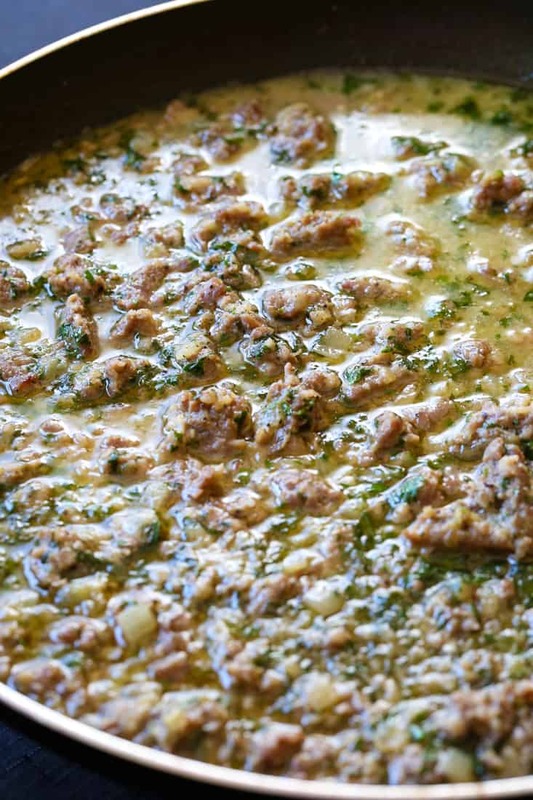 Once the sausage is browned, add the onion and grated apple. Cook for 5 minutes until the onion and apple have softened. Add the poultry seasoning, parsley, salt, pepper and chicken broth. Bring the broth to a simmer and cook for 15 minutes over medium low heat. Remove the skillet from the heat and let cool for 5 minutes. 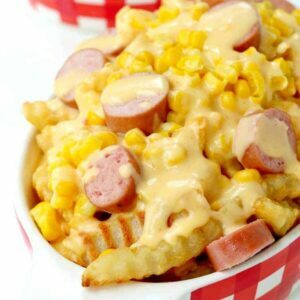 Place the toasted hot dog bun pieces into a large bowl with the mozzarella cheese, then pour the chicken broth and sausage mixture on top. Stir gently to combine then add the cream and stir well to combine. 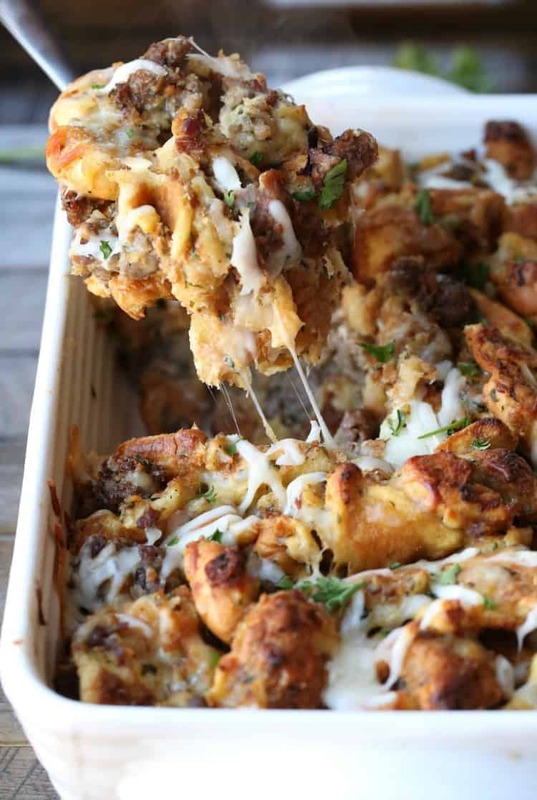 Pour the stuffing into a buttered 9″ x 13″ casserole dish, cover with foil and bake for 30 minutes. Remove the foil, add a few pieces of butter on top of the stuffing and bake another 10 minutes uncovered to crisp up the top of the dressing.